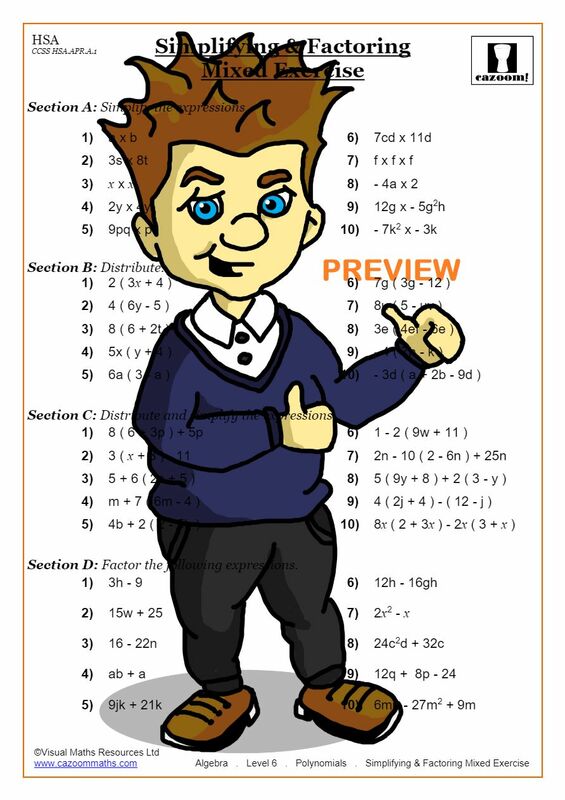 Our factoring worksheets are designed to help students factor all types of expressions. From applying the distributive property to factoring quadratic expressions, our factoring worksheets are all clearly presented and easy to follow. 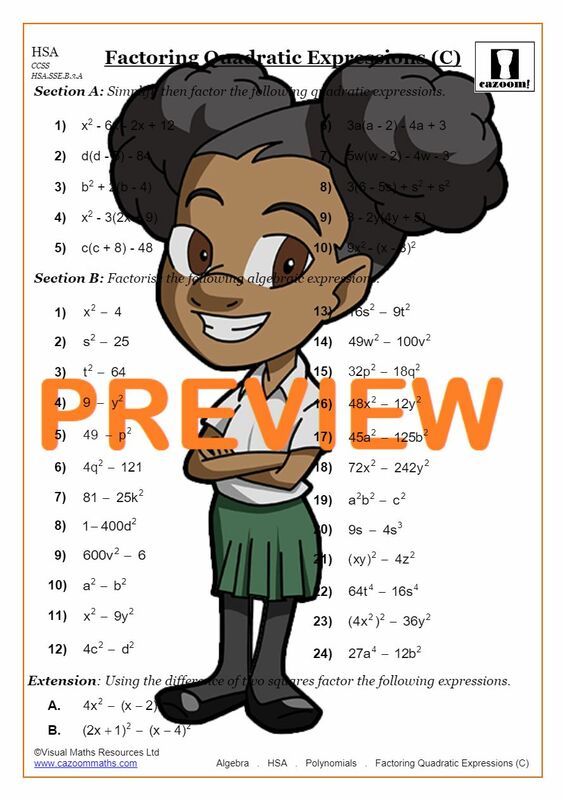 We have factoring math worksheets suitable for Pre-algebra through Algebra 2, and they are all supplied with answers to assess how well your child or student is doing, and highlight areas for review. We have a wealth of resources to improve students’ confidence when it comes to expanding and factoring algebraic expressions. 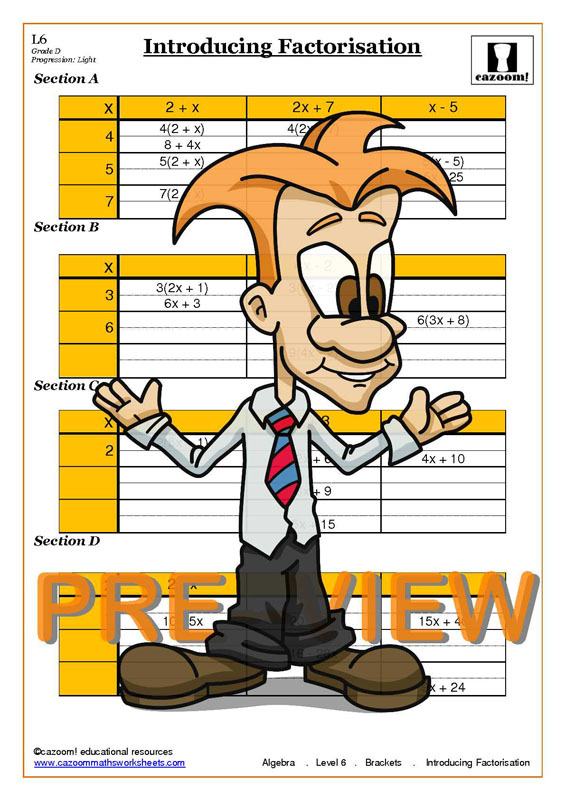 Algebra is unavoidable at school so make it enjoyable by using our factoring worksheets! Use our factoring worksheets cover all sorts of factoring and expanding, from multiplying a constant by a binomial to factoring out the common factor to factoring quadratic expressions. At Cazoom Math, our worksheets cover all types of factoring problems that students will come across during their time at school, and present this important information in a clear and engaging way. 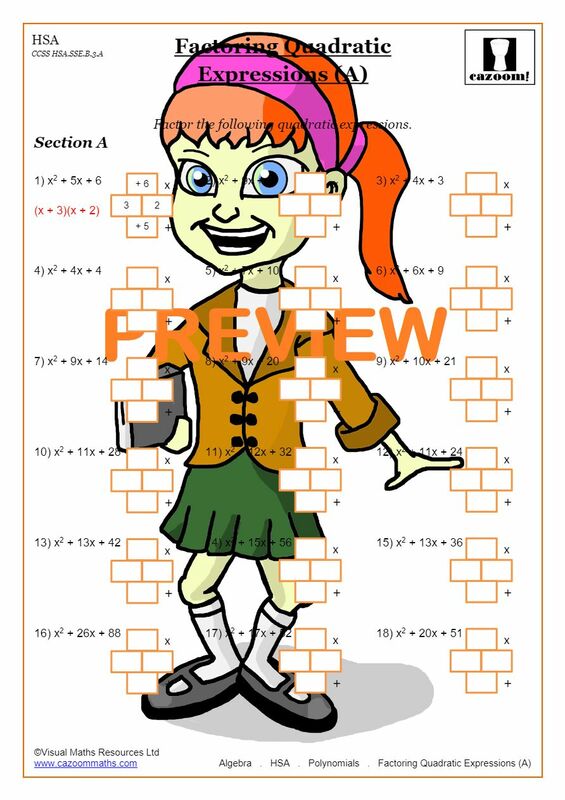 Take the fear out of factoring with our factoring worksheets! Factoring is a method that is useful for middle school students through college students and beyond. Factoring can often be a stumbling block for students as they will need to apply this skill to many other topics in Algebra, such as solving and graphing quadratic equations. Learning how to expand expressions and factor expressions of all types is an essential skill, and although students might complain that they will never need this information, what they don’t realize is that factoring is very important and useful. 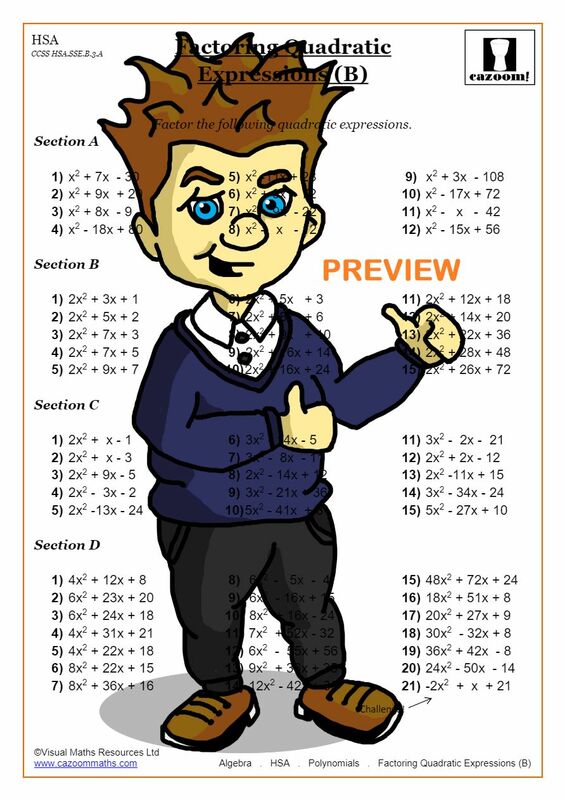 Learning how to factor expressions will help prepare students for all math courses that follow, as this is a skill that appears in Trigonometry, Precalculus, Calculus, and beyond. If students wish to study math or science at the university level, factoring is an essential skill. Using clearly presented math worksheets will help familiarize students with the types of questions they will come across and enable them to feel confident when approaching factoring in their further studies. People who work in the science, engineering, or technology fields will use their algebra knowledge and factoring skills every day. Within these industries, there are computer applications that solve equations and simplify expressions, but computer issues can occur, and in these cases, staff will have to rely on the knowledge they learned in school. Students might not realize just how important factoring might be for them, so use engaging factoring worksheets to help them gain confidence with this skill.